"Many thanks for being a partner with St. Christopher School. The food that you provide for our school lunches is always fresh and nutritious The children and faculty enjoy it very much." Holiday Celebrations: With the diverse ethnic backgrounds of those in our community we love to share in the celebrations that enrich the lives of those around us. We view it a privilege to be part of any religious celebration. Baptisms and christenings: This joyful occasions is one to remember. 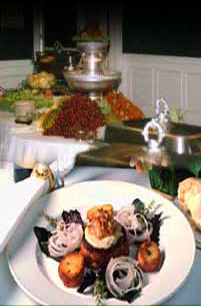 We provide small platters to full buffet dinners. Bereavement receptions: Please call on us for help with this unexpected event. This is obviously a very stressful time in a family's life. We're here to help you through this stressful time. We will manage everything for you. This is a time of unexpected grief and expenses so we're mindful of your budget.